Kolkata top cop Rajeev Kumar is accused of destroying evidence related to the Saradha chit fund scam. Kolkata Police Commissioner Rajeev Kumar, accused for his alleged role in destroying evidence related to the Saradha chit fund scam, was also questioned in the Rose Valley scam on Sunday, sources said. He arrived at the CBI office in Shillong for questioning for the second consecutive day on Sunday morning. Mr Kumar was questioned by the CBI for nearly nine hours on Saturday. The investigative agency confronted Mr Kumar on Sunday with former Trinamool parliamentarian Kunal Ghosh, who was told to appear at the CBI office for questioning in person in connection with the case, CBI sources told NDTV. Mr Kumar and Mr Ghosh were questioned face to face for five hours in connection with the Saradha chit fund and Rose Valley scams, sources said. They were both questioned in the initial period by a 10-member team of the CBI, the officials said. 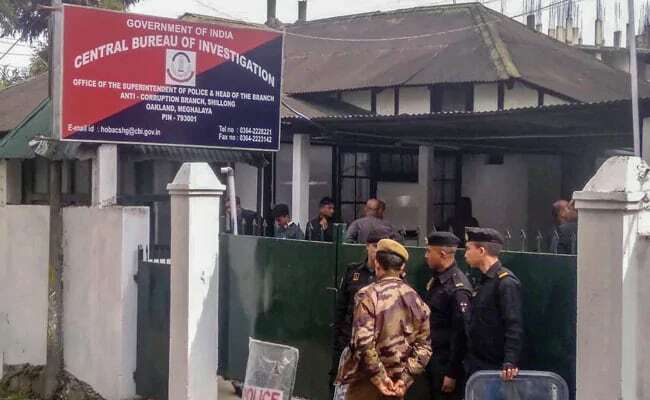 CBI officials from Kolkata investigating the Rose Valley scam also came to the Shillong office with documents, sources said. Kunal Ghosh, who arrived here shortly after 10 am, sought blessings of goddess Saraswati at a pandal, barely 100 metres from the CBI office, before entering the office of the investigating agency at Oakland, news agency PTI reported. "Both were questioned and made to sit face to face in the later half of the day. Each of them were questioned separately in the initial period," a CBI official was quoted as saying by PTI. The former Trinamool Congress MP was arrested in 2013 in the Saradha chit fund scam and has been out on bail since 2016. Quoting officials, news agency PTI reported that three senior CBI officers questioned Mr Kumar for nearly nine hours on Saturday about his alleged role in the tampering of crucial evidence in the scam. The CBI has not released details of the interrogation yet. The police official's counsel, however, said that he is "cooperating and complying" with the CBI. "He (Kumar) has come here on the orders of the Supreme Court. He has complied earlier and he is complying now as per the orders," Mr Kumar's counsel Biswajit Deb, who is also the Trinamool Congress coordinator for Meghalaya, was quoted by news agency as saying. The CBI is relying on a 91-page letter from Mr Ghosh, who was expelled by Trinamool, to the Enforcement Directorate, detailing the role of Rajeev Kumar in handling the investigations in the chit fund scam. Mr Kumar began investigations after the main accused, Sudipta Sen and Debjani Mukherjee, both promoters of Saradha Group of companies, had fled to Kashmir, officials said in Kolkata. They were arrested in 2013 from Kashmir. Three senior CBI officers questioned Mr Kumar for his alleged role in the tampering of crucial evidence in the scam. Mr Ghosh has named BJP leader Mukul Roy, who was once the most trusted man of West Bengal chief minister Mamata Banerjee, and 12 others in the Saradha scam. Accompanied by three high-ranking officers of the Kolkata Police, Mr Kumar has been lodged at a top hotel in the city. A CBI team from Delhi arrived in Shillong to question him. On Tuesday, the Supreme Court had directed the Kolkata Police Commissioner to appear before the CBI and "faithfully" cooperate with the probe into cases related to the Saradha chit fund scam. It had, however, stated in no certain terms that Mr Kumar was not to be arrested. The CBI has alleged in the Supreme Court that Rajeev Kumar, who led the probe by a special investigation team into the Saradha chit fund scam, tampered with electronic evidence and handed over documents to the agency -- some of which had been "doctored". A major controversy had broken out last week, when a team of CBI officers went to Mr Kumar's residence to question him but faced stiff resistance from the Kolkata police. Following this, Chief Minister Mamata Banerjee staged a three-day protest to "save the Constitution". The central investigating agency had said that it wanted to question Rajeev Kumar to plug the holes in the Saradha investigation case as he was supposed to be in possession of certain key documents as a member of the special investigation team.